Cut half the melon into cubes and blend in blender. Pour mixture into ice cubes tray totaling 28 ice cubes. Freeze until solid, about 5 hours. Blend a small amount of watermelon and strain through fine mesh strainer to retrieve 1 cup of watermelon juice. In a small saucepan bring to a boil juice and sugar stirring occasionally until sugar dissolves. Remove from heat and let cool to room temperature. Place in refrigerator and chill while ice cubes freeze. 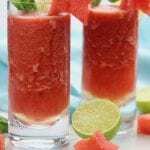 Once ice cubes are solid, place all 28 cubes in blender with lime juice, mint, rum and 1/4 cup of watermelon simple syrup. Blend well. Serve in chilled glasses and garnish with mint, lime slices and/or chunk of watermelon. Simple syrup recipe makes enough for several mojitos. Amounts of rum, mint, lime and simple syrup may vary depending on taste preferences.